Kendall Felix, who pleaded guilty to second degree conspiracy and first degree hindering prosecution, was sentenced to a minimum of two years and four months to a maximum of seven years Wednesday. קול העולם שרייבט אז ער איז נישט די קידנעפער/מערדער, ער האט נאר פארדעקט באווייזן. די קידנעפער/מערדער איז נאכנישט דא קיין אורטייל. וואס הייסט נישט געווען?? איז ער געזעסן אין יענע קאר? האט ער ארויס געהאלפן אים אריין כאפן? דאן איז ער געווען א חלק פון די קאנספירעסי! זינט ווען קומט מען אפ אזוי ביליג?? איך האב פארשטאנען אז ער איז בכלל נישט געווען אויפן סצענע, ער איז נאר נאכדעם געגאנגען פארדעקן באווייזן. איך בין אים נישט דן, איך פארצייל נאר די פאקטן. כמדומה לי אז איינער וואס איז געווען אינוואלווד אין א קידנעפינג וואו איינער איז געשטארבן קען מען קלאגן יענעם מיט מארד אפי' אויב ער האט גארנישט געהאט מיט'ן מארד. Erskin Felix hatched a plan to kidnap Menachem (Max) Stark, Hy”d, for money, resulting in Stark’s accidental death, according to graphic testimony by a witness who has already been convicted for Stark’s kidnapping and murder. Kendel Felix, Erskin’s cousin, testified Tuesday that Erskin approached him in December 2013 and asked for his help with the plot. Stark, a real-estate developer, was kidnapped on the night of January 2, 2014, and his body was found, smoldering in a dumpster on Long Island, the next day. Kendel was convicted of murder and kidnapping in September 2016. Kendel is cooperating with prosecutors in the case against Erskin — who prosecutors say masterminded the plan — in the hope of receiving a reduced sentence. Kendel, along with several other cousins, worked as a carpenter on construction sites that Erskin managed, which were owned by Stark and a partner, Thomas Falcone. Kendel said that, while he had heard some construction workers in the past talking about a “Max,” he had never known Stark. At one point, Erskin told Kendel that if, during the kidnapping, Stark — whom Erskin knew well and who had employed Erskin to do construction work on his own home — saw his face, “he’d have to take him out,” meaning “kill him,” Kendel testified. What remains unclear is how Erskin could have attempted to recover a debt from Menachem without Menachem seeing his face. Observers have raised various theories: that Erskin never really intended to recover a debt from Menachem — perhaps Menachem didn’t even owe him money — but intended to hold him for ransom, and used the “debt-recovery” argument as a way of trying to get Kendel to join; or that Erskin in fact had planned all along to kill Menachem once they were able to get money. Erskin called Kendel on January 2, 2014. “He said he needed my help, I thought it was probably to pick up some tools,” Kendel testified. Erskin was driving a minivan owned by his father, which Erskin and others on the construction sites frequently used for work. Kendel got into the van, and Erskin drove to 331 Rutledge Street in Williamsburg, telling Kendel that this was Menachem’s office. Erskin asked Kendel to go check if Menachem’s Lexus SUV was parked nearby. Kendel did as he was asked, confirming that the car was there. Eventually, Erskin pulled out, saying he had to run errands. But Kendel saw Menachem’s SUV driving in front of them — and it was then that Erskin showed Kendel how his phone was tracking Menachem; Erskin had placed a tracking device under Menachem’s car weeks earlier. Menachem drove to several homes, presumably to pick up rent envelopes, before driving to his own house and staying there for a while. Kendel and Erskin then drove to the Queens home of Menachem’s partner, Thomas Falcone, where Erskin went inside for some time before re-emerging. Erskin then drove to Long Island, and parked in front of what Kendel described as a “huge house,” which Erskin told him belonged to “Max’s partner,” whom he did not name. Then Erskin drove back to Brooklyn, continually telling Kendel “he needed somebody to trust” and “he could depend on me,” according to Kendel. They drove in a blizzard to Menachm’s office, and parked right behind the Lexus SUV; Menachem had returned to his office earlier that evening. Erskin instructed Kendel to “distract” Menachem, while Erskin “could come behind him and put him in a headlock and knock him out,” according to Kendel. Surveillance video shows Menachem struggling with the two kidnappers for several minutes. There were audible sighs and sobs from the Stark family side of a packed courtroom as, for the first time, on the sixth day of this trial and more than five years after Menachem’s murder, the family heard the gruesome details of that fateful night: How Erskin knocked out Menachem while Kendel duct-taped his hands and feet; how Kendel “picked up his yarmulke and threw it inside the van”; how he helped Erskin lift an unconscious Menachem and put him inside the van; how Erskin duct-taped Menachem’s mouth, then took the ski mask off his own head and put it, backward, over Menachem’s; and how, at one point, Menachem regained consciousness and Erskin then kneeled on his chest. At Erskin’s direction, Kendel then drove to Erskin’s home, where they picked up Erskin’s brother Kendall Felix; then they went to a different home and picked up another cousin, Irvine Henry. It was there that Henry noticed that Menachem was not breathing. He had died of suffocation. Erskin and Henry tried retrieving the tracking device from under Menachem’s car but, finding the area swarming with cops, left. Erskin told Kendel and Kendall to drive to Long Island and get rid of the body. The two drove in a snowstorm to Great Neck, where they put the body in a dumpster and set it aflame with gas purchased at a nearby gas station. On cross-examination, Erskin’s defense attorney Mark Henry Pollard seized on the brain damage and memory loss that Kendel admitted he suffered in a 2010 motorcycle accident, seeking to cast doubt on Kendel’s version of the events. Questioning the witness’s character, Pollard also pointed out how Kendel had associated with members of the Crips gang, and had even appeared in a video with them, giving a gang sign, though Kendel insisted that when given the opportunity, he declined to actually join the gang. Henry has pleaded guilty to hindering prosecution and attempted tampering with physical evidence, and will also testify against Erskin. Pollard’s defense centers on portraying Henry and Kendel as seeking to put the blame for their own crimes on Erskin — a man who cared for them and got them jobs, and whom they looked up to — as they seek reduced sentences. As no faces are visible from the kidnapping video, and a number of Felix relatives and co-workers used the van, Pollard will argue that it was not his client that carried out this crime. Prosecutors say they will show cellphone-location-data evidence that Erskin was, throughout the night, in the places where Kendel said he was, and text messages Erskin sent to co-conspirators in the days that followed, discussing the crime. Kendall Felix has pleaded guilty to conspiracy in the second degree, and will be sentenced Wednesday to between 2-1/3 and seven years in prison. What’s going on Williamsburg It’s smelling from fire? אויפן גרוך שפירט עס צו זיין די מצה בעקערי׳ס וואס הייצן אן די אויווענעס..
וואס איז פארגעגאנגען שבת ביינאכט ביי בעדפארד אין לינטש? טשיינע מען אין ווילאמסבורג - פארשפארט! רבותי היינט פארשפארט זיך דער לעצטער "טשיינע-מען קלינערס" פון דיוויזשאן ביי דריגס. דער איד וועלכער פלעגט כסדר אריינגעבן זיינע העמדער צו קלינען דארט, האט זיך געמאכט איינמאל אז ווען ער איז געקומען אויפפיקן האט ער זיך דערזען אָן דעם טיקעט מיט'ן נומער דערויף. האט ער געזאגט פאר'ן כינעזער אז ער האט פארלוירן דעם טיקעט, אבער ער קען דאך אים שוין אזוי לאנג. רופט זיך אָן דער כינעזער "פּאַליסי, נאָו טיקעט נאָו שוירטס". עס האט נישט געהאלפן קיין פודינו ומצילינו, דער כינעזער האלט זיך ביי זיינס. דער איד האט געהאט דעם קאפ אויפ'ן פלאץ, און האט באשלאסן גוט אנצולערנען דעם כינעזער. ער איזגעגאנגען אין מקוה און צוזאמענגענומען א הויפן מיט אלטע העמדער וואס זענען דארט פארבליבן, און האט עס אריינגעטראגן צו גוי צו קלינען. פארשטייט זיך אז ער איז בכלל נישט צוריקגעגאנגען עס אויפפיקן. אזוי האט ער גוט מסדר געווען דער כינעזער טיפש... און אים געלאזט הענגען מיט די פילע אלטע העמדער. טא וואו איז די לייק קנעפל? ס׳קוקט אויס צו זיין די טרעילאר פון תומכי שבת, איוואר? 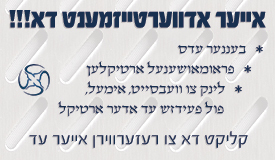 נישט די פאפא סוכה סטארידזש. יעצט איז דאך פאר פסח..
דאס איז דאך ניסים אז קיינער איז פונקט נישט געשטאנען דארט..
שעפעלע טייערס. 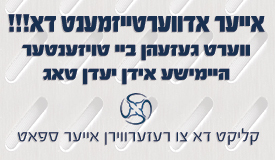 פון די טרעילאר ווערט פארטיילט טויזענטער דאלער אין ווערד פון צורכי יו״ט פאר פאמיליעס וואס ברויכן צוקומען צו הילף. כ'גלויב אז ר' יעקב שלמה וועט עס אויפהויבן מיט א גארטל, עמיר אויסווארטן א טאג צוויי. ר' אברהם מרדכי ז"ל וואלט זיכער געשמייכעלט. farshlufen האט געשריבן: כ'גלויב אז ר' יעקב שלמה וועט עס אויפהויבן מיט א גארטל, עמיר אויסווארטן א טאג צוויי. וואס האט מען געקלערט? די בענקל גייט האלטן דעם טרעילער? די בענקל איז געשטעלט אז ס'זאל זיין מערקבאר פאר דורכגייער.